The CASQA Annual Conference offers a unique opportunity to interact with professionals in the stormwater field. Each year the conference draws leading members of the stormwater community including local, state, and federal decision makers, stormwater program coordinators, contractors, consultants, engineers, lawyers, scientists, and planners. Join over 1200 participants for 3 days of important training and discussions addressing a range of challenges and opportunities facing stormwater practitioners in California and beyond. 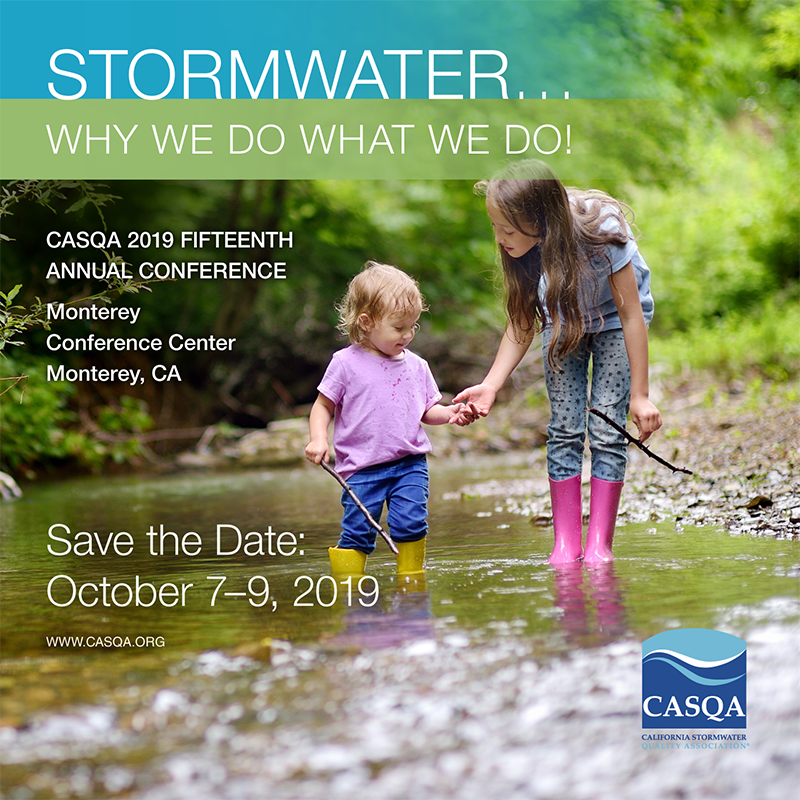 We look forward to seeing you for our 15th CASQA Annual Conference at the Monterey Conference Center - October 7-9, 2019. Stormwater... Why We Do What We Do! Looking back over the last 30 years, it was in 1989 that a few early champions of California’s stormwater community banded together to form the California Stormwater Quality Task Force. The Task Force quickly emerged as the cutting-edge statewide stormwater collaborative organization, bringing together stormwater professionals to help members achieve the goals of the Clean Water Act while improving the efficiency and effectiveness of stormwater management. As the reach of the stormwater regulatory program broadened, so did the needs of the California stormwater community. To help meet these growing needs, the Task Force organized and formed the California Stormwater Quality Association (CASQA) in 2002. CASQA continues to be a leader in stormwater and is committed to seeing stormwater managed as a vital component of California’s water resources, to support human and ecological needs, to protect water quality, and to restore our waterways. Looking forward into the next thirty years and beyond, it is vital to not only be stewards of our waters, but to also be mentors for the next generation that will continue to protect and enhance our waterways for future generations. As an organization, CASQA will foster sustainable solutions to our water quality challenges, incorporating the best science and technologies to promote the health of our natural waters. New Conference Elements for 2019! The 2019 CASQA Annual Conference brings some exciting new elements! This year we are pleased to announce that we have opened up our abstract submittal process beyond technical presentations and posters, to also include submissions for training workshops, panels, forums, and roundtable discussions. The conference will continue to offer three days of in-depth learning opportunities and discussions on a wide-range of stormwater and water management topics, with a focus around the conference theme. For 2019 we have also made some changes to the agenda by moving the Plenary Session to Monday morning to officially kickoff the conference with our Welcome Remarks, CASQA Awards Announcement, and Keynote Presentation. This will be followed by a new morning session, afternoon training workshops, and a field tour. Over 125 concurrent session presentations following multiple conference thematic tracks, as well as panels, forums, and roundtable discussions, will provide two additional packed days of stormwater information from leading stormwater practitioners from across California and the world. NOTE: The abstract submittal process will include technical presentations, posters, panels, forums, roundtables, and training workshops. Check back here mid-late April 2019 for an announcement of the opening of the 2019 abstract submittal period. CASQA will email the selection results (both selected and not-selected) to the primary speakers & poster-only presenters late June 2019. CASQA members are invited to nominate a worthy individual, project, program, or media item for an award. Winners will be highlighted at the 2019 CASQA Annual Conference. Note: Due to the printing deadline the printed conference program does not include changes made in the last few weeks before the conference begins; if necessary, an errata sheet will be provided. CASQA offers a variety of registration options to suit your schedule, including a live webcast of the Monday Training Workshops and the Tuesday Plenary Session for those not able to travel to the conference. CASQA members receive a substantial discount. Learn more about becoming a CASQA member to take advantage of discounted rates. We invite you to consider one of the many opportunities for exhibiting, sponsorship, and advertising. Some sponsorship packages have limited availability so please act quickly to secure the one you want. Here you can find rates and registration information for the conference hotels, maps and parking information for the hotels and the Monterey Conference Center, airport and other transportation options, as well as links to nearby attractions and activities. Conference attendees with Apple iOS or Android devices will be able to personalize their conference experience with the many features in our CASQA Annual Conference mobile app. Connect with fellow conference attendees on our Twitter or LinkedIn CASQA Annual Conference pages. We look forward to seeing you at these future conferences! Presentations from past conferences are available as PDFs linked to the Training Workshop and Technical Program presentation titles in the conference agendas. Note: Files not posted lack permission from the author for posting or a copy was not provided to CASQA.